Perfect in pink. Poulter was claiming his first major tournament in the United States. (CNN) -- Ian Poulter beat fellow Englishman Paul Casey 4&2 in the final of the WGC-Accenture Match Play championship to claim the biggest title of his emerging career. Poulter is renowned for his flashy dress style, but let his golf do the talking with a dominant display at Dove Mountain to earn a winning check of $1.4 million which almost guarantees him a spot on Europe's Ryder Cup team later this year. Poulter was once ridiculed for his comments to a golf magazine when he talked up his chances of ousting Tiger Woods as world number one. He claimed his remarks were misrepresented but with Woods continuing his "indefinite break" from tournament golf, Poulter has the chance to make good on his promise and has risen to number five in the rankings off the back of his victory in Arizona. 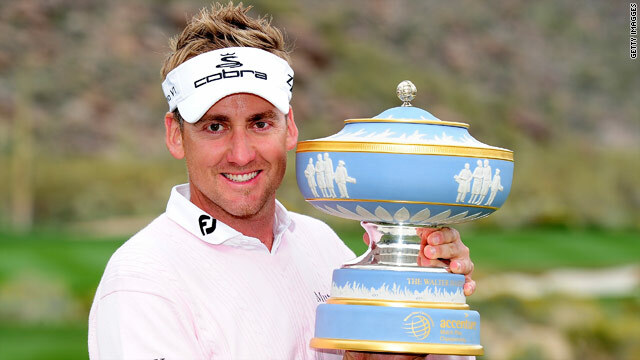 Poulter savored his moment of triumph and his first victory in America. "It feels really, really nice," he said. "It's been a long time coming and I am very happy. "It was a good day's golf. I knew I was in great form and I felt calm all day -- nerves didn't play any factor at all." Casey had to finish his semifinal held over from the previous night with Camilo Villegas, winning on the 24th, before taking on Poulter. It was hardly the ideal preparation for world number six Casey, who was beaten in the final of the tournament last year by Geoff Ogilvy of Australia, but he took the lead with a conceded eagle on the second. But Poulter hit back with a birdie at the next and was never headed again, opening up a four-hole lead on the 14th. He had a good chance to go five up at the next, but failed to take advantage with Casey pulling back to two down at halfway of the 36-hole final. But it was as close as Casey came to challenging his Ryder Cup counterpart who re-opened his four-hole advantage in the early play of the afternoon round. Casey hit back to win the ninth and 10th to be two down again, but the final killer blow of the afternoon came at the 15th where Poulter's brilliant approach from a difficult position set up a sure fire birdie. Casey missed his birdie putt to be three down with three to play and after finding the bunker on the short 16th saw Poulter hole his birdie putt to close out a memorable victory. Colombian Villegas thrashed Sergio Garcia of Spain 5&4 in the playoff for third place.